A quick and easy recipe for a fluffy cake. 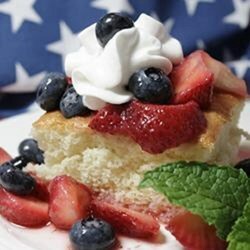 Great with strawberries! Preheat oven to 350 degrees F (175 degrees C). Grease and flour a 9×13 inch pan. Sift together the flour and baking powder. Set aside. Heat milk and butter in a small saucepan until just boiling, then remove from heat and set aside. Beat eggs until thick and pale yellow in color. Beat in sugar, salt, vanilla and almond extract. Reduce mixer speed to medium and add hot milk in a steady stream. Quickly beat in flour mixture. Spread batter into prepared pan. Bake in the preheated oven for 30 to 35 minutes, or until the center springs back when lightly tapped.